Pre heat oven to gas 5, 170 degrees, using the middle shelf. Prepare baking dish by rubbing olive oil. This helps serve pasta easily AND also easy cleaning. In a large pot boil water and cook pasta until soft or as you like your pasta. Drain. Keep aside. In a nonstick wok, pour the oil from the tuna cans and heat oil. Add sliced onions and fry until golden. This can take up to 10-12 mins. Once golden set aside and discard oil. In the same wok, heat butter and add plain flour. Quickly stir so the flour cooks, taking out its raw flavour. You should be left with a smooth paste like base, quickly add milk using a spatula or whisk rapidly stir to avoid any lumps. Add the cheddar cheese and rapidly stir creating a smooth and glossy sauce resembling cake batter. It must not be too liquid. Now its time to combine all the components together: the pasta, tuna, sweetcorn, onions and the cheese sauce. Give it all a good mix. Add the mixture to the baking dish, top with cheese and breadcrumbs are an optional extra for crunch. Bake for 15 minutes until the cheese has melted. This creamy tuna pasta can be enjoyed immediately, warm or room temperature. Tastes delicious in all levels of temperatures. My best ever recipe with tuna and pasta in a creamy cheesy sauce . Its so easy, even the children can take part making this recipe. 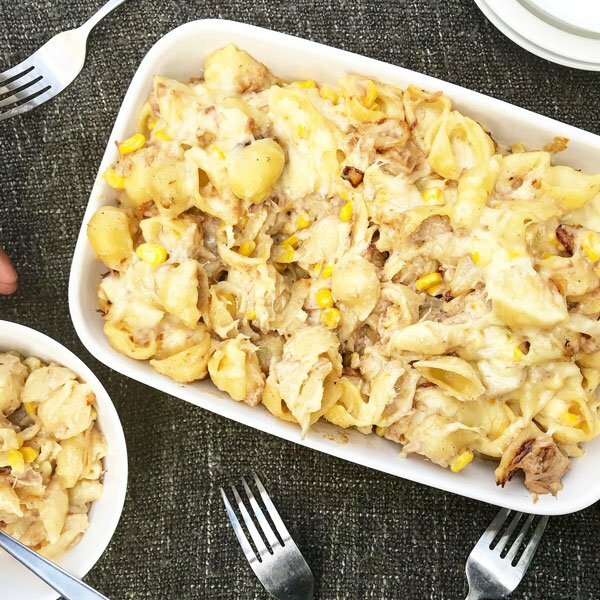 So easy and tasty make this your weeknight special and thats why i like to call this recipe my TUNA TUESDAY PASTA BAKE! Iv grown up enjoying tuna and sweetcorn with lots of mayo (Hellmans off course) in sandwiches. Iv also posted recipes on Instagram using it as a substitute for bolognase. (a perfect recipe when trying to reduce your red meat intake). 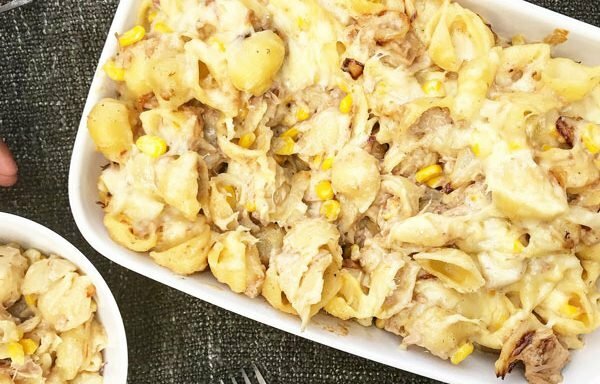 But Have you ever tried tuna and sweetcorn in a pasta bake? Well, do. ? Its calorific YES, but when you're hungry, or just want to spend less time in the kitchen, this is the perfect bake which is budget-friendly, quick and easy to prepare and can be pre-assembled making it an easy make- ahead meal. This is homely, comfort grub at its best and in our case, when Hungry Husband comes strolling in after work, and the pasta has reached room temperature, It’s absolutely delicious! And for summer days, cold too in a packed lunch for your Mr, its a winner! I just love how versatile this is. It freezes fabulously too (thats off course if you can resist the temptation)!!! Give this delicious tuna pasta bake a go and leave a comment if you like and let Hungry know how you enjoyed it. ps don't even think about opting out the fried onions, its the best bit that adds that touch of class to this recipe !